In the ’90s when ever I thought of frugal recipes I turned my attention to my copy of How to Feed Your Family for £5 a Day written by the incredibly talented and innovative cook Bernadine Lawrence. Bernadine’s book was updated in 2012 and imho is the best frugal food cookery book out there. Now that we have the internet every one has access to lots of frugal recipes and frugal foodie sites, but I would still highly recommend you buy a copy of Bernadine’s book. 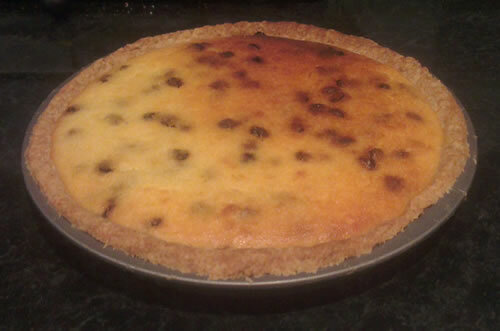 I always wanted to try out the baked cheesecake recipe which has a filling made from sweetened mashed potato, lemon and sultanas but for one reason or another I never got around to it. Well what better day to bake some thing new from my favourite frugal recipes book than a miserable grey Sunday? Having explained to my children that I was making a “fake bake” cheesecake using mashed potato and being met by looks that suggested care in an institution might be on the cards I set to work. My daughter decided to join so an hour or so later the fake bake was ready. So far three of my children have sampled the cheesecake and all declared it a resounding success. I must confess I’ve already happily munched my way through more than one slice and am having to restrain myself from sampling some more! If you have decided to live a more frugal lifestyle there are lots of things you can decide you no longer need and can do with out, but food is not one of them so to reduce your food spend you are going to have to look at cheap meals you can cook. I like to look at cooking cheaply as a challenge – the more mouths you have to feed then the more money you can save. Having been hood winked in to feeding my family horse meat recently (thanks Asda corn beef) I decided to look at different options for buying meat. I no longer trust the supermarkets and when I looked at buying my meat from farm shops with high welfare standards their prices were outside my budget. I want to be able to cook cheap meals for my family but I do not want to compromise on the quality of the ingredients I am using. Cheap meals shouldn’t have to mean feeding your family horse! I did some searching online and discovered Westin Gourmet which lets you order gourmet meat online at competitive prices. My first order was for 20kg of chicken breasts which entitled me to 18 free sausages and free delivery. This may seem a lot of chicken to order all in one go but my oldest son and a couple of his friends have already bought 6kg of chicken from me at cost price so I have a mini meat co-operative now. Earlier in the week I’d used a £50 e-voucher earned by accumulating nectar points against my weekly shop which I had delivered from Sainsbury’s and which came to just under £13, so had lots of ingredients waiting to make cheap meals for my family. Sausages are always popular in our house so I decided that had to be the first thing I tried from my Westin Gourmet order. Step 1 – I chopped up 1.5kg of onions from my weekly shop and gently fried them for 30 minutes adding a dessert spoon of sugar to maximize the sweetness of the onions. You have to make sure you constantly turn the onions to avoid them sticking and burning so no wandering off! When the onions had caramelised nicely I put 2/3 of them in a container in the fridge to make quiches the next day when I had more time. Step 2 – Brown the sausages. I did this in a frying pan turning the sausages for an even colour, but you could be healthier and oven cook them. Step 3 – To make the gravy take your already caramelized onions and add them to a pan with a heaped spoon of plain flour. Mix these together then pour in approximately a pint of boiling water with a beef stock cube dissolved in it. Simmer the mixture on a low heat until your gravy starts to thicken. 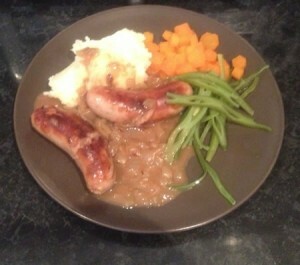 Step 4 – Serve your sausages and onion gravy with freshly cooked vegetables. We chose to use carrots, runner beans and mashed potatoes as that’s what we had in. If you are vegetarian or vegan this meal could easily be adapted for you by using vegetarian / vegan sausages and making the onion gravy using a non meat stock cube. Onion gravy also is a great accompaniment to nut roasts and burgers. Happy cooking and I’ll be sharing another cheap meal recipe with you soon featuring the left over caramelized onions.